The sign at Acadia National Park brings wonderful memories of this beautifully unique place instantly to mind. The Acadia National Park personalized Christmas ornament honors this island park with granite peaks like Cadillac Mountain, deep woods, rocky beaches and the abundant wildlife and sea life that call Maine’s Mount Desert Island their home. The Acadia NP ornament faithfully replicates the sign and the park symbol and will look right at home among the boughs of your Christmas tree. This is part of a collection of blown glass US national park ornaments from Russell Rhodes including those from Smoky Mountain and Glacier NPs. 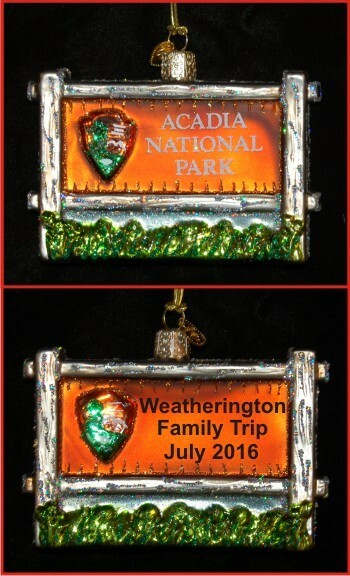 We’ll hand-personalize the Acadia National Park glass Christmas ornament and include our plush velvet gift bag too.